If you are reading this that means we all made it to Friday! Hooray! 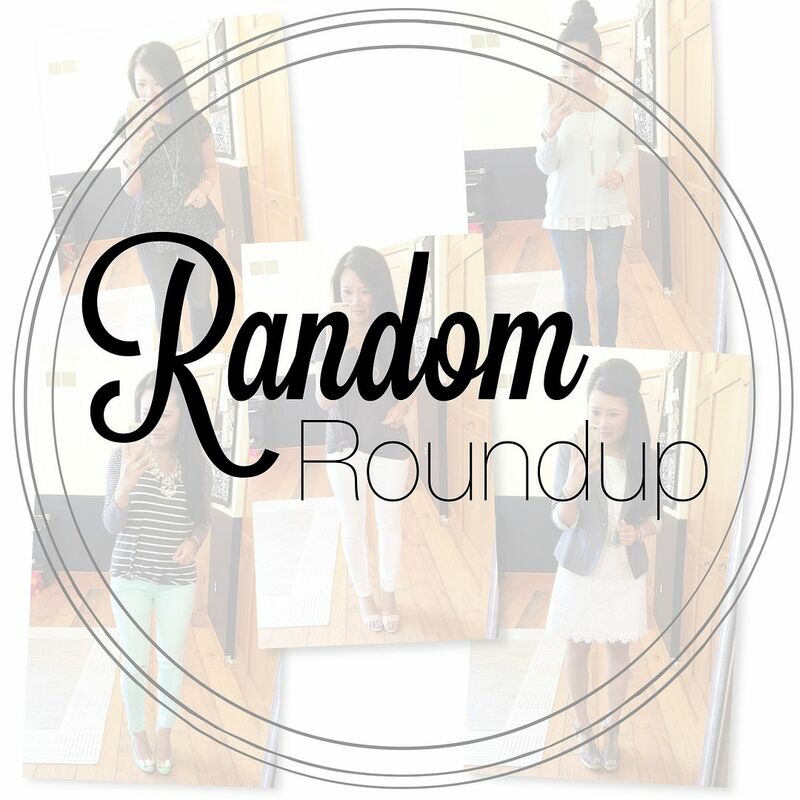 That also means this is the last Random Roundup for October, can you believe it? I know I cannot!! Let's not waste any time, and just jump right into it! 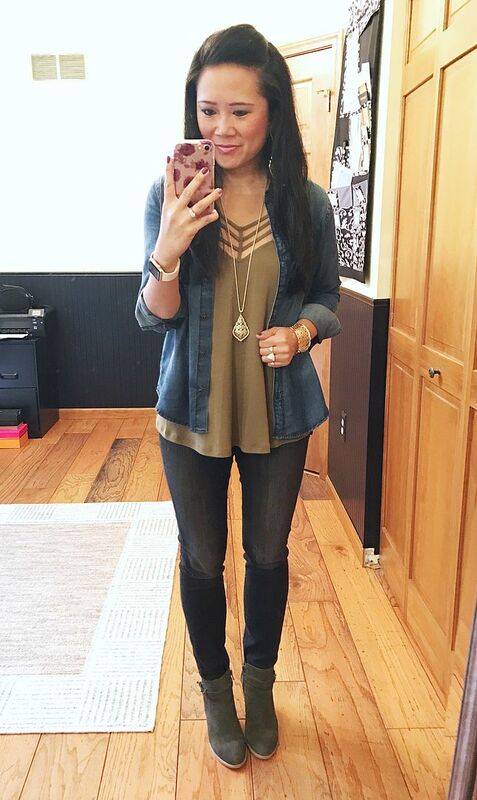 Chambray: Caslon | Tank: Express | Necklace: Kendra Scott "Aiden" | Bottoms: Express (option) | Booties: Sole Society "Lyric"
Kinda funny story about this outfit. Ok, not really funny, but I went to this local sushi place by the office to eat lunch on my own while the husband was traveling for work. I was reading something on my phone when the server came to drop off my miso soup. Well, he did just that. Somehow the bowl slipped out of his hand as he was setting it down right in front of me, so if I were the king pin, let's just say he got a strike. The entire bowl spilled in my lap and down the front of my shirt. I immediately stood up trying to avert all the hot liquid straight down my clothes verses soaking through my clothes and scalding any skin. Luckily I didn't get burned, but I had to eat the rest of my lunch soaking wet and smelling like soy. It was awful. I go to this restaurant regularly, so it was a bit awkward to have to complain, but I told the manager what happened and that I didn't think I should have to pay for my meal. She just awkwardly smiled and told me not to worry about paying and so I ventured to Old Navy behind work to buy a pair of leggings and a tunic. My $15 lunch was free, but my $30 new outfit was on me. Not to mention the half hour I wasted having to stop over there. But there was no way I was going to sit at my desk smelling myself and being uncomfy all day!!! I wore this to my Pilates Certification orientation meeting. I wasn't sure if we were going to work out or not. I was *pretty* sure we wouldn't because we were meeting with our advisor at her house, but then again, most instructors own their own reformer, so I figured I should be prepared just in case! All I needed to do was take off the sweater and booties and throw on a workout tank, and I would be Pilates-ready. We ended up not working out, just going over some general info and asking questions! I still felt appropriately dressed in this regardless. A couple of weekends ago we took family photos with his parents and siblings then went to a winery! Everyone else in the family was wearing burgundy, blues, and yellows, so I fit right in with this combo! And yes, another lace up top to add to my collection. It transitioned perfectly into a winery outfit also for the most perfect fall day! I could wear these olive skinnies every single freaking day. I'm not even joking. They fit like a second skin and I just love that. They're crazy comfy and they're the perfect silhouette for booties, too! 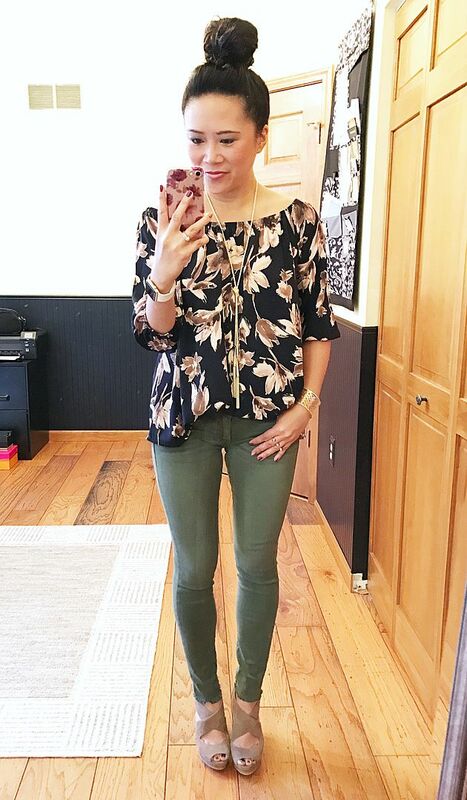 I hadn't worn this floral top (last seen here) to the office yet, so this was an easy outfit to throw on! You don't know it, but there was about an hour delay from me writing the description for the last outfit and this one! Somehow I inadvertently installed some stupid malware pop up onto my laptop so I just spent the last hour trying to figure out how to remove it! Ughhhhh. And the husband (and dogs) have been in bed for awhile now, so I had to do this adult stuff all on my own. It must have worked though (knock on wood) because the pop ups are gone. Thank goodness for google. ANYWAY, I think I saved my favorite for last anyway! 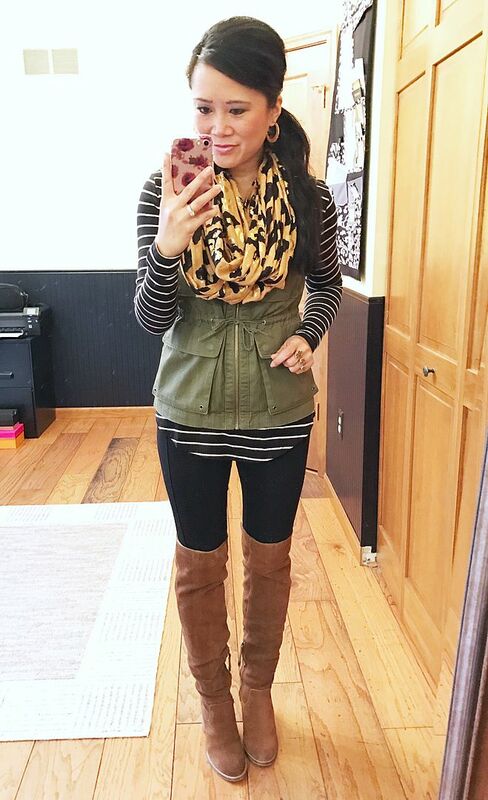 Stripes, leggings, OTK boots, leopard scarf, and a vest! Pretty sure this is an obligatory blogger outfit, but I'm not sorry at all to wear it. There is a reason why this outfit combo gets repeated! Why reinvent the wheel? And on that note, I am going to take some sleep aid meds and get to bed! (No, I don't take these all the time, but when I'm working up until the time I go to bed, it takes quite awhile for my brain to turn off and rather than toss and turn, it's just faster to get some help to catch my z's faster. Especially when it's midnight.) Insert crying emoji here!!! I love how you close your utility vest, if it wasn't so darn warm here I would totally do that lol. So glad you were able to get your computer fixed!! That's so frustrating! 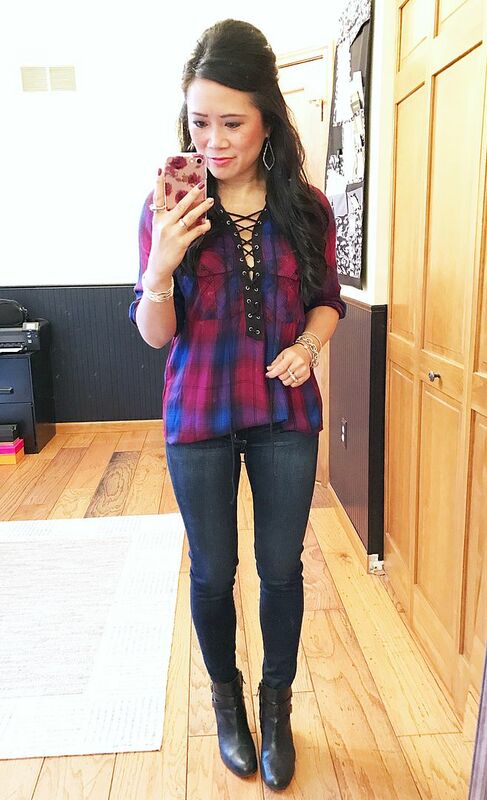 Loving all of the cute new tops you've added to your wardrobe this season! So sorry about the soup incident. That stinks!! I love those olive skinnies so much. Speaking of skinny, you are just looking so amazing. All your hard work is definitely visible. Love how you closed the vest on the last look. Really shows your waist. Have a good weekend! It takes me forever to get to sleep sometimes! I think it's a woman thing because we seriously have so many things our our plate our brains are constantly in ON mode. Love that bralette from Express. 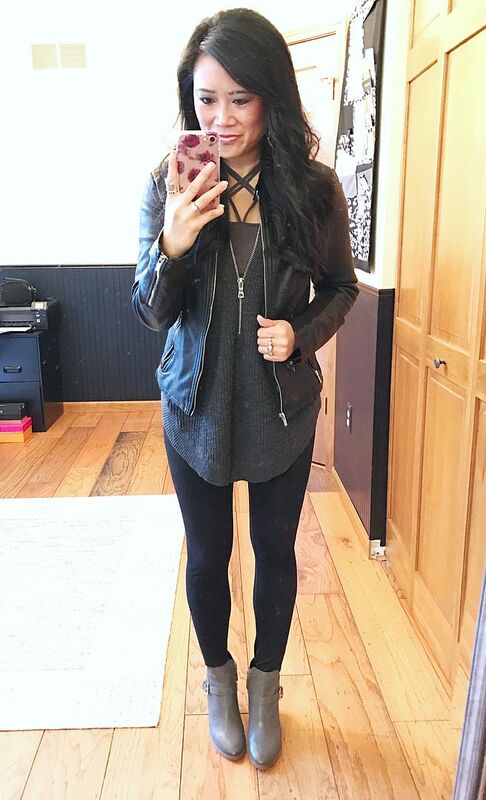 The criss cross details under your sweater are so fun! I love every single one of these looks! Sorry about the soup . . . I would've done the same thing as you. Thats so awful about the miso soup! Ugh I would be upset, too. I really love those olive pants in the second to last outfit! You're looking super fit lately!